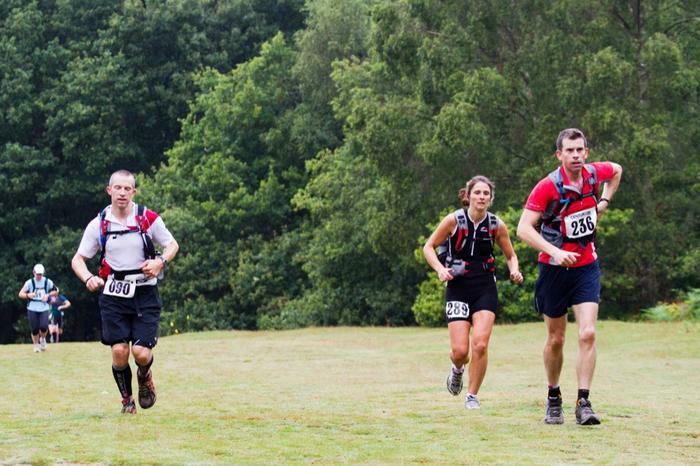 The NDW100 is a 103 mile continuous point to point trail race along the North Downs Way from Farnham in the Surrey Hills to Ashford n Kent. Runners must reach the finish line within 30 hours to be elgible for awards. There are further cut offs on route. The race starts at the western origin of the North Downs Way trail and stays entirely on the national trail until Knockholt Pound where runners will detour to the Village Hall 50 mile aid station. The race then continues on 50 miles further east down the trail, to Ashford and the finish. This is a National Trail maintained by the National Trail Trust together with the various county councils and extends all the way to Dover on the South East Coast of the United Kingdom. The trail is open year round to the public, but cuts through a mixture of private land and public byways. It is absolutely essential that runners respect the land at all times on the course. The race begins at the very start of the NDW trail. Following the briefing, runners will be led down to the race start point approximately 400 yards from the school. The NDW trail starts at a Waymark post on the corner of Station Hill and the A31 Farnham Bypass. The route begins on a short stretch of tarmac running alongside a river before heading into more rural ground. The NDW trail is predominantly off road but runners get a quick insight into the overall terrain of the course within the first 4 miles as the route makes its way through woodland, over tracks through fields and along minor roads through villages. 1. Course Route: The race will be a point to point run of 103 miles. 2. Familiarity: Knowledge of the trail offers both physical and mental advantages . Runners are advised to cover/ recce as much of the trail as possible before race day, particularly the sections that you expect to run in the dark. 3. Weather: Temperatures during the race could range from just a few degrees to 35 degrees celcius and runners should be fully prepared for both extremes. Humidity during August in the South East is high. Weather conditions are unpredictable and can change rapidly. If it rains the ground will become wet, slippery and in places very muddy, presenting technical footing particularly on the trail and stair sections of the course. 4. Hydration: If it is hot, it will also likely be humid and hydration will be crucial to your safety and enjoyment of the event. Even if it is cold it is extremely important to stay hydrated. The aid stations are positioned such that water is available at regular time intervals, always make sure you have the capacity to carry enough to cover the distance to the next aid station (please see medical notes further down this document on hydration/ salt intake balance). 5. Trail Markings: Permanent North Downs Way markings include sign posts, finger posts and other fixed markers all displaying either the acorn symbol or 'North Downs Way' text. These can be used during recce's and during the race as the principal source of navigation. Additional trail markings over race weekend will consist of red, white and silver reflective tape, Centurion directional arrows and orange chalk paint at major junctions. Race staff and volunteers do their best to provide a marked trail, but it is necessary for runners to continually remain alert as they travel. On occasion, course markings may be removed or vandalised, or course markers may not be able to place signage at a critical turn due to unusual circumstances. Knowledge of the trail, particularly of those miles that will be covered in the dark, will be of infinite benefit to the runner. You are ultimately responsible to follow the correct course. 6. Dropping: If you have to drop out of the race at a point where your crew (if you have one) is unavailable, we will make every reasonable effort to get you to the finish or to the nearest major checkpoint that is still in operation, particularly if you are in need of medical attention. In non-emergency situations, you may have to wait several hours before being transported. Our principal responsibility is to put on a run, not to run a shuttle service for non-finishers; so please be patient. All aid stations have cut offs and will close as soon as the cut off is reached. If runners are still behind on the course when a cut off is reached, the aid station crew will wait for them before departing. We will remain in situ until every runner is accounted for. We will give runners EVERY opportunity to make the cut off but if you are pulled from the race officially, you will have your number removed and should you wish to continue, you will do so at your own risk. A full list of the cut offs can be found under the aid station section. A sweeper bus will travel the course reaching each aid station at the cut off and picking up stranded runners. 7. Trail Etiquette: Please be courteous to hikers, mountain bikers, horse riders and other runners. Please also respect that many residents back on to the trail. Keep noise to a minimum through those areas and throughout all sections traversed during the night. LIttering of any kind will result in immediate disqualification. 8. Volunteers: Volunteers will do everything possible to make your day a success. Many spend more hours out on the trail than do the runners themselves. Please be polite and make a point to thank them. Without the volunteers, there would be no race. Crews are in no way essential at this event, we look after you with fully stocked aid stations, medical support and plenty of volunteers to help you on your way. However, having a crew can provide a psychological lift and ensure that you have the food and drink you prefer and changes of clothing along the way. A separate tab listing all crew access locations is available here. Crews may meet runners or assist them ONLY at the points listed on the crew info page here. The aid station locations and many other points on the course are remote and too small to handle ANY additional parking. If your crew do assist you outside of the permitted points, you the runner will be disqualified. PLEASE ensure your crew do not break this rule - you will threaten the future of the race by doing so. YOU are responsible for the actions of your crew. We cannot make this any clearer, if your crew attend anywhere outside areas deemed as permitted crew access, you risk disqualification from the event. We get people every year who are fully aware of the rules and continue to disobey them. It threatens the future of the event so please ask them not to do it. A pacer may accompany a runner on the trail during the race but only from Knockholt Pound aid station onwards. Pacers are allowed solely as a safety consideration for fatigued runners. Absolutely no physical or mechanical aid may be given by the pacer to assist the runner over difficult sections of the trail except in medical emergencies. Pacers should be experienced trail runners in excellent physical shape and conditioned adequately to run in potentially difficult weather conditions over considerable distances. Most pacing will be done during night time hours and early morning; so pacers should be warmly dressed, used to running with flashlights, and familiar with the trail. Pacers should be adequately supplied with lights, food and water. They may accept food/ drink and medical assistance at the aid stations. 1. A pace runner is any individual who accompanies an entrant for any distance greater than 100 yards at one time. 2. One pacer at a time may accompany each runner from Knockholt Pound, the 50 mile aid station through to the finish but no pacers are permitted of ANY KIND prior to the runner reaching Knockholt. 3. Pacers may only meet runners/ handover to a different pacer at locations deemed crew access permitted available at this link. That means that some pacers will need to be able to cover over 20 miles at night with a very fatigued runner. Please make sure your pacer is equipped to manage this. 4. Multiple pacers are allowed but NO MORE THAN ONE PACER may accompany the runner at any time. 5. Pacers must be at least 18 years of age. 6. Pacers can travel ON FOOT ONLY and must enter and leave each aid station with their runners. 7. No mechanical or physical assistance may be given by the pacer to the runner at any time. 8. Please respect the trails; littering of any kind is strictly prohibited. PACERS MUST COMPLY WITH ALL RUN RULES AND REGULATIONS, INCLUDING THE RULES, RULES FOR PACERS AND ALL INSTRUCTIONS FROM RACE STAFF. The North Downs Way 100 is an extremely challenging event and participation presents numerous medical risks, many of which can be extremely serious or fatal. The medical team on site for the weekend is provided by GB Emergency Medical Services. At any one time during the race there will be a minium of one ambulance/ medical support car on call. There will also be a static medical team at the finish from the time of the first, to the time of the last finisher. In addition there will be medical crews at some of the major aid stations. It is important for each entrant to recognise the potential physical and mental stresses, which may evolve from participation in the race. Runners may be subject to extremes of heat, cold, hypothermia, hyperthermia, dehydration, hypoglycemia, hyponatremia, disorientation and mental and physical exhaustion. We and the medical staff strive to work with runners and will do all we reasonably can to ensure “safe passage” to the finish line, but ultimately runners must understand their own limitations. Adequate physical and mental conditioning prior to the race is mandatory. If you have not been able to prepare properly, do not attempt to run. Runners should appreciate the risks associated with participation in this event. Actions may have to be taken on your behalf under extreme time constraints and adverse circumstances. We will make every effort to give assistance whenever possible but ultimately and primarily you are in charge, and you are likely to be solely responsible for creating your own crisis that we must then respond to. Be careful, be responsible, and do not exceed your own abilities and limitations. IN THE EVENT THAT A RUNNER REQUIRES EMERGENCY EVACUATION, THE RUNNER ASSUMES ALL FINANCIAL OBLIGATIONS CONNECTED WITH THIS SERVICE. CENTURION RUNNING IS NOT RESPONSIBLE FOR ANY DEBTS INCURRED. Runners should have adequate insurance in place to cover those eventualities. 2. Effects of Cold/Hypothermia: Temperatures in August in the UK are usually in the high teens or low 20s celcius, however particularly at night, the temperature may drop down in to single figures. With wet conditions and/or moderate to high winds runners will be open to severe exposure during the event. Hypothermia is a serious risk, especially at night and in the wet since one’s energy reserves will have been depleted from 20 or more hours of running. Hypothermia can strike very quickly, particularly when pace slows from exhaustion or injury. The initial warning signs of hypothermia often include lethargy, disorientation and confusion. The runner will feel very cold with uncontrolled shivering and may become confused, unaware of the surroundings, and may possibly be an immediate danger to his or herself. Staying well-nourished, adequately hydrated and appropriately clothed will help avoid hypothermia. It is essential that runners carry warm clothing with them at all times on the course and where possible to have access to warm clothing through their support crews, drop bags, or preferably both. 3. Risks Associated with Low Sodium and Chloride Counts: Low sodium levels (hyponatremia) in ultramarathon runners have been associated with severe illness requiring hospitalization. It is important for long-distance athletes to use fluids or eat foods containing electrolytes/ salt to replace the water and salts lost during exercise. WATER INTAKE ALONE IS NOT SUFFICIENT, as water intoxication and possibly death may result. This problem may in fact worsen after the Race, as the non-electrolyte-containing fluid which has been accumulating in the stomach is absorbed. Potassium and calcium replacement may also be important, although these levels change less with fluid loss and replenishment. Signs and symptoms of hyponatremia include; weight gain, bloating, nausea, vomiting, headache, confusion, lack of coordination, dizziness, muscle twitching/cramping and fatigue. If left untreated, it may progress to seizures, pulmonary and cerebral edema, coma and death. There are two ways to put oneself at risk of hyponatremia; 1) over-hydration (with water or even electrolyte-containing sports drinks) and 2) replacing sweat with hypotonic fluids. Risks of hyponatremia include weight gain and low sweat rate. 4. Vehicle Hazards: Much of the trail is near to, crosses or travels along roads which are NOT marshalled. There are therefore several areas on the course where runners and pacers must be watchful for vehicles. Runners cross all roads at their own risk. 7. Injuries from Falling: Falling is an ever-present danger on trails, with potentially serious consequences. Much of the trail is narrow, uneven and rutted and there are some significant sections of stairs where particular attention is required - particular in the vicinity of Box Hill and between Detling and Hollingbourne. The course may be covered with sitting water which will create significant challenges and potential hazards to runners. 1. Social Hazards. The NDW100 course makes its way through many small towns and villages as well as many more remote sections of countryside without any artificial lighting. There is always the opportunity for undesirable characters to be on or around the trail and the chance that they may cause trouble for runners. For that reason we advise all runners to avoid running alone at night. Runners who want to listen to music should use headphones during the daylight sections only and be aware of their surroundings at all times on the trail. We recommend for all runners to have a pacer from Knockholt Pound onwards if they can. From there onwards, aid stations captains will offer those that want it, the option of buddying up with other runners, right through to the finish. If you are in any doubt, wait for the next runner to come through and traverse the next section with them. You can then either await another buddy runner arrival or continue on. 2. Road Crossings. As mentioned frequently throughout this document, there are many road crossings, busy road junctions to negotiate and sections of the trail that travel along roads. The junctions will NOT be marshalled. You the runner must be alert and aware at all times when emerging on to roads. We advise all runners to recce the route prior to race day, particularly the sections they will negotiate at night and make themselves familiar with the road crossing on the route. It is YOUR responisibility as a runner to navigate all road crossings safely. 3. Getting lost. Whilst the course is marked, runners must be prepared to follow the National Trail waymarkers as the principal source of navigation, remembering that the acorn is the symbol of the National Trail. The North Downs Way is the major trail through this area. Race staff and the volunteers do their best to provide a marked trail, but it is necessary for runners to continually remain alert as they travel. In places, the NDW travels through large open fields or hillsides where it is impossible to place markers. Furthermore, on occasion, course markings may be removed or vandalised. Knowledge of the trail, particularly of those miles that will be covered in the dark, will be of infinite benefit to the runner. YOU are ultimately responsible to follow the correct course. The course will be marked with tape, directional arrows and glow sticks (all three will be displayed to runners at the briefing) but these are out in the open and may be removed or vandalised during the course of the event. If you do lose the route, check your map and return to the last marker point you saw on the trail and make your way once again from there. If you are still unsure, wait for another runner to come through who might have experience of the course first hand. We recommend that all runners run as much of the route as possible prior to race day. These type of running events survive because of the incredible volunteers who work the aid stations. Without them there would be no race. There are a minimum of 13 aid stationson the route. Many of the aid station captains have either ultrarunning or medical experience and have been fully briefed as to what runners will require during the race. Many of them are race directors themselves and are hugely experienced at managing these type of events. The aid stations are well stocked with fluids and a variety of foods. The fluids that are generally available are Water and Coke. The foods that are generally available are: fruit, cookies, chocolate bars, jelly babies, nuts, a limited number of energy gel packets, sandwiches, wraps etc. All aid stations from Knockholt onward will have hot tea and coffee. Hot food is available at Knockholt, Detling and the finish. Without the assistance of the volunteers and race medics, there would be no race. Many of these volunteers have spent days preparing for the run and will be out on the course for over 30 hours assisting runners. They have given up their weekend to insure you the best possible chance of success. Courtesy and sincere thanks from the runners will go a long way to help make their day. Transportation of drop bags will be possible to the locations listed below. This service is provided to aid crewless runners. Those with adequate support are asked not to overload our volunteers with unnecessary drop bags. Drop bags must be securely tied, labelled clearly with the runner’s name, the aid station the drop bag is to go to and entry number. A separate drop bag is required for each aid station, not one for all as they will be transported only to the aid station written on them and then the finish. Drop bags must be deposited at registration. Runners are limited to one drop bag per permitted aid station. Pacers are not allowed drop bags. Please do not use paper bags, shoe boxes, or anything made of paper-like products. These can get wet and tear easily. Drop bags must NOT exceed 30cm x 20cm x 20cm in size ie. the size of a shoe box for any one aid station - with the exception of the finish line bag which may be larger (up to a standard kit bag size). Drop bags will be transported to the finish line for 12 noon on Sunday. Drop bags not collected at the finish will be disposed of. Do not ask to reclaim your drop bag after the race has closed, they will be disposed of so don't leave anything valuable in them. Cut-off and “pace” times are listed on the Aid Station Chart. Cut-off times reflect the deadlines for LEAVING the aid station. If you return to an aid station after the cut-off, you will be pulled from the race. The cut-off times will be strictly enforced by the Aid Station Captains. Anyone leaving an aid station after the cut-off time will be disqualified. This rule is for the safety of all participants. IF YOU MISS THE CUT-OFF, YOU MUST STOP. Significant sanctions will apply to anyone breaking this rule. If you miss a cut off you must hand in your race number to the aid station, at which point you are officially withdrawn from the race. The aid station captains will try to relocate you to where you need to go but our first priority is to the runners still in the race and aid station personnel may well have dual duties at other aid stations to attend to once their station closes. All entrants who finish the race in full accordance with the rules qualify for awards given in recognition of their achievement. 1. All finishers in under 24:00:00 hours will receive a 100 MILES - ONE DAY finishers buckle and race shirt. 2. All finishers in under 30:00:00 hours will receive a 100 MILE FINISHER buckle and race shirt. nb. Runners crossing the finish line after the 30 hour cutoff will not be listed as official finishers. Male and Female Race winners will be awarded the Centurion Trophy, marking their achievement. M40, M50, M60, M70. F40, F50, F60, F70. Parking available in the public car park. Charges may apply. Knockholt Village Hall, Main Road, Knockholt Pound, Sevenoaks, Kent. There is a car park behind the village hall. The aid station is in a new location for 2017, at Wrotham Cricket Club - in the pavilion. Crew may park there and attend to runners. This is approximately 100 metres from the old location on the Village Common. Leave the M2 at junction 3 and follow the signs for Blue Bell Hill village off the A229. Turn right at the end of the village opposite the public house and the site entrance is on the left. Detling Village Hall, Pilgrim's Way, Detling, Kent. There is parking at the front of the hall. Please keep noise to an absolute minimum so as not to disturb the neighbours. Runners will make a full lap of the track to finish in front of the Grand Stand. Supporters are invited in to the Stadium to watch their runners finish.